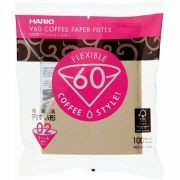 Here you will find paper coffee filters for Hario V60 and Chemex coffee drippers, coffee makers and coffee carafes. For Chemex vi have pre-folded round and square filter papers for the 3, 6, 8 and 10 cup models. We also have paper filters for the Hario V60 series coffee drippers. Hario filters are available in sizes 01, 02 and 03 in both bleached and natural paper.